MailOptin allows you to exponentially grow your mailing list and display targeted messages across your WordPress website with popups, before/after post optin forms and sidebar widget subscriber forms. MailOptin is full featured and comes with an easy to use form builder and template builder that allows you to create beautiful optin forms and email newsletters that are optimised for the highest of conversions. MailOptin "exit intent" and slide-ins trigger convert abandoning visitors into subscribers by your optin campaign at the precise moment they are about leaving your website. If your opt-in form display too early, your reader might not yet be willing to subscribe and waiting too long will make you lose out on new lead. Our "pageviews" and "time on site" triggers give you fine-grained control over the display of your optin campaigns. The "scroll trigger" display optin forms or messages only after the a visitor scrolls a down a specific percentage of your page. Our analytics show you important metrics to improve your lead-generation strategy and make data-driven decisions to increase your revenue. We offer full integration with MailChimp. This means that your new subscribers will automatically be synced to your MailChimp list and automated email campaigns delivered to them. MailOptin is perfect for business owners, bloggers, designers, developers, photographers, and basically everyone else. MailOptin was added by collizo4sky in Jul 2017 and the latest update was made in Aug 2017. The list of alternatives was updated Jan 2019 There is a history of all activites on MailOptin in our Activity Log. It's possible to update the information on MailOptin or report it as discontinued, duplicated or spam. Create website widgets to convert your websites users! (Forms, POPUPS, slide ins, top & bottom bars, countdowns). 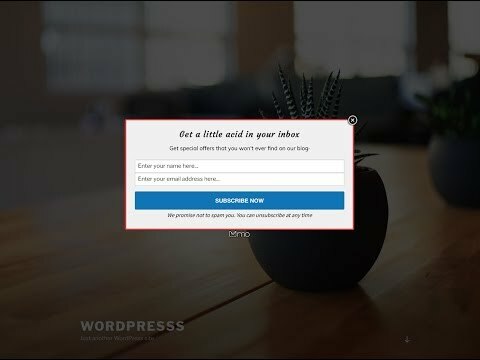 The Easy Opt-ins WordPress plugin helps you increase conversions by making it really easy to add beautiful, highly converting email opt-in / lead-gen forms to your site. Alternatives to MailOptin for Web, Wordpress, Self-Hosted, Shopify, Windows and more. Filter by license to discover only free or Open Source alternatives. This list contains a total of 21 apps similar to MailOptin. No reviews yet for MailOptin, want to be first? Maybe you want to be the first to submit a comment about MailOptin? Just click the button up to your right!